One of the captive nuts on the fascia on my car was stripped out so to fix that I made my own captive nut by cutting a rectangle shape out of a repair metal from Thrifty hardware and drilling and tapping it for the 4MM original machine screw. I used a bench grinder to make the new nut have the same size as the original and to have the beveled edges the original has. The existing machine screw size is 4 MM and according to my drill and tap sheet the drill size to use for tapping is 1/8" (or 3.3MM) which worked well. The fascia nuts I had were stripped out bad enough that I could not be sure what the pitch was so I won't list that to avoid posting inaccurate info. 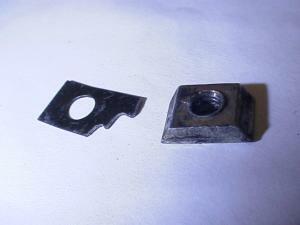 The existing captive nut can be easily removed by prying open the two metal retainer strips that are in front of and in back of the nut that hold it captive. I had to use care to pry the strips just far enough so that the stripped nut was removable as otherwise the new nut would want to fall out if the strips were sprung out.